Chambery, France: Chambéry is a city in the department of Savoie, and located in the Rhône-Alpes region in south-eastern France. 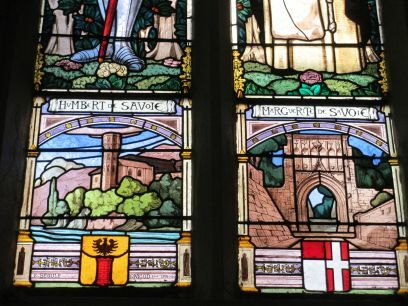 It is the capital of Savoie and has been the historic capital of the Savoy region since the 13th century, when Amadeus V of Savoy made the city his seat of power. 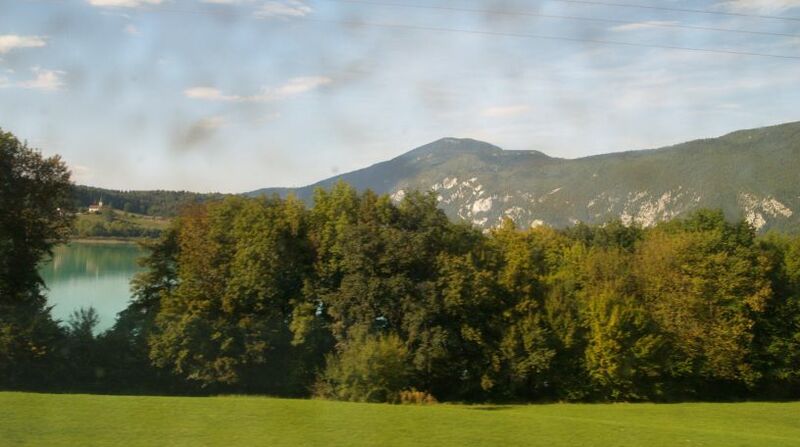 Chambery, France: Local scenery viewed from TGV train from Paris. 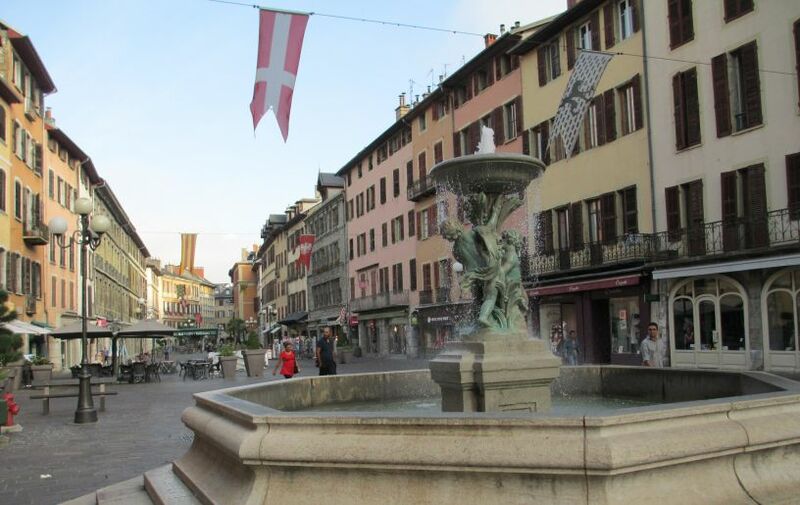 Chambery is a beautiful town to visit in the Rhône-Alpes region of France and is the birthplace and historic capital of Savoie. The town of itself Chambery lies in a valley in the Alps surrounded by the Bauges and Chartreuse mountain ranges and provides an almost 'surround' views of the French Alps. To the north, it is bordered by Lac du Bourget, the largest natural lake in France. 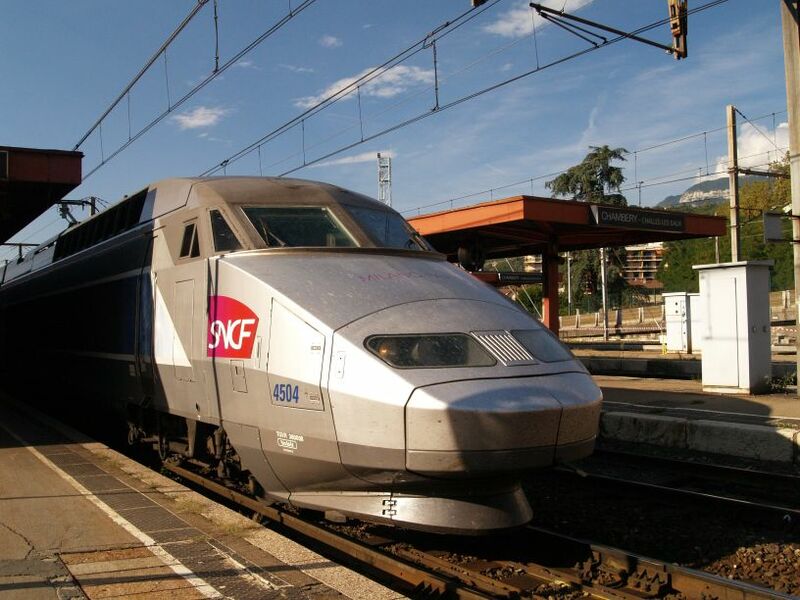 A classic high speed SNCF TGV train at Chambery railway station on which we arrived in Chambery from Paris. 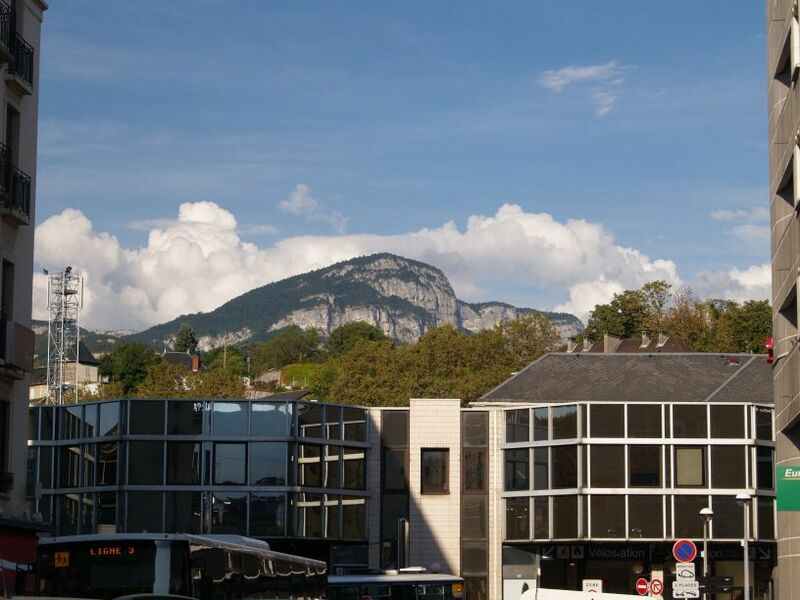 Chambery, France: Looking over Chambery SNCF station towards the mountains. 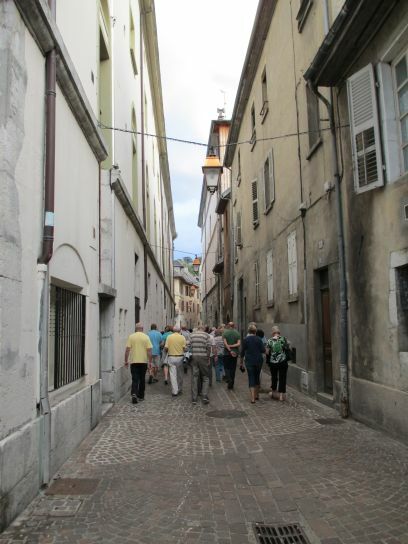 Chambery has long been a "crossroads to the Alps" dating all the way back to the 11th century. 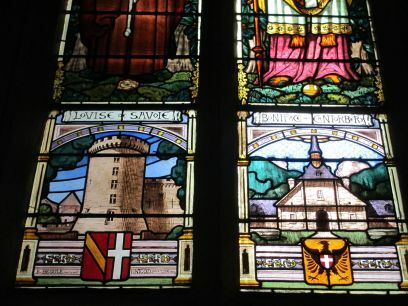 For many years, it was ruled by the Duchy of Savoie before being annexed to the King of France. Jean-Jacques Rousseau wrote the Declaration of the Rights of Man (the French version of the Bill of Rights) while living in Chambery. 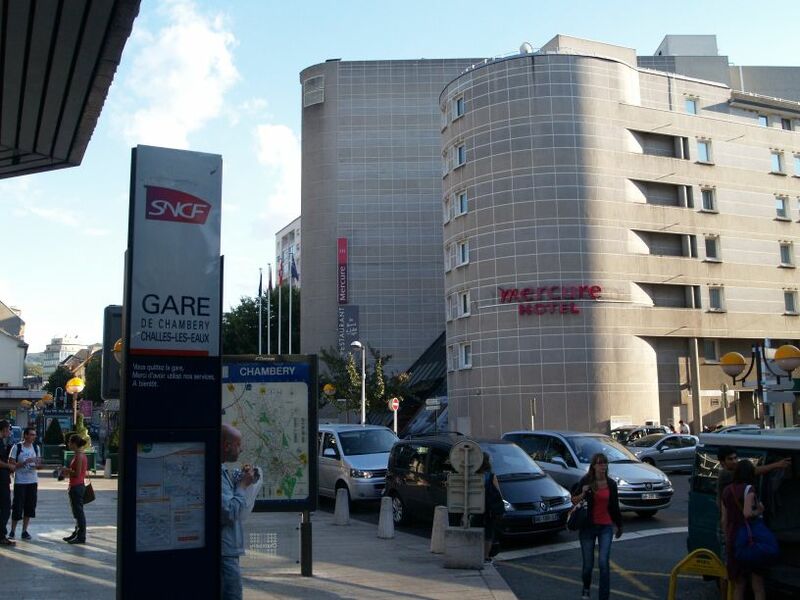 Chambery, France: We stayed in the Mercure Hotel just across the road from the SNCF Gare de Chambery Challes-Les-Eaux, and very comfortable stay it was. 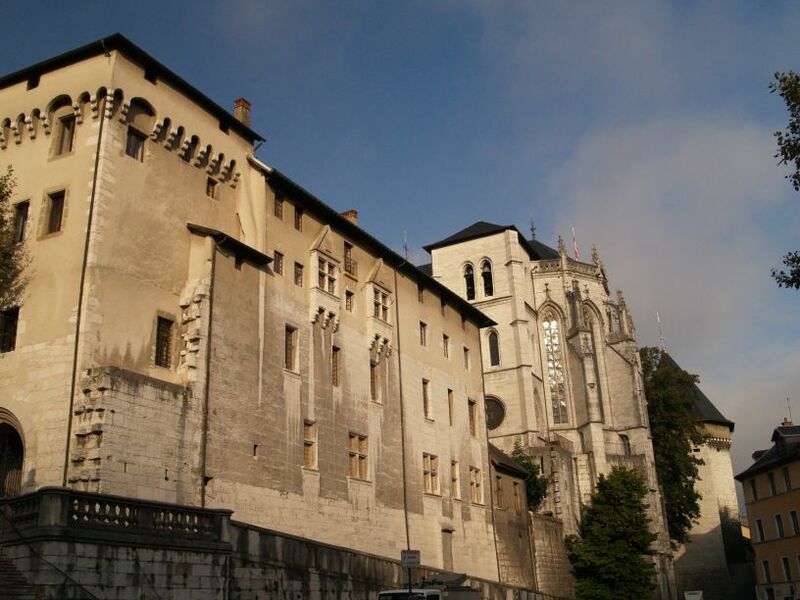 Chambery, France: The tower and east end of the Cathedral and one of the old cobbled streets of the town centre. 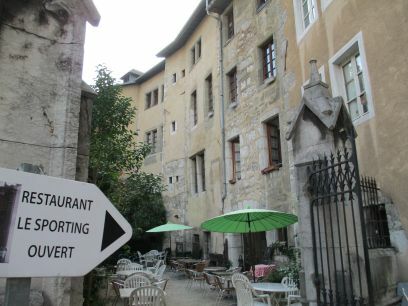 Chambery is a charming and peaceful place to visit with beautiful architecture, good food and wine, and friendly people. There are many vineyards in the locality and on Saturdays, the city public market stalls are filled with the fresh cheeses, meats, and local produce from the Alps. The Chambery area in the Rhone Alps offers many recreational activities to choose from in all seasons, from skiing and snowshoeing, to sailing and rock climbing. The medieval section of the town is quite well preserved (pictures above and below). There are also local and regional buses. 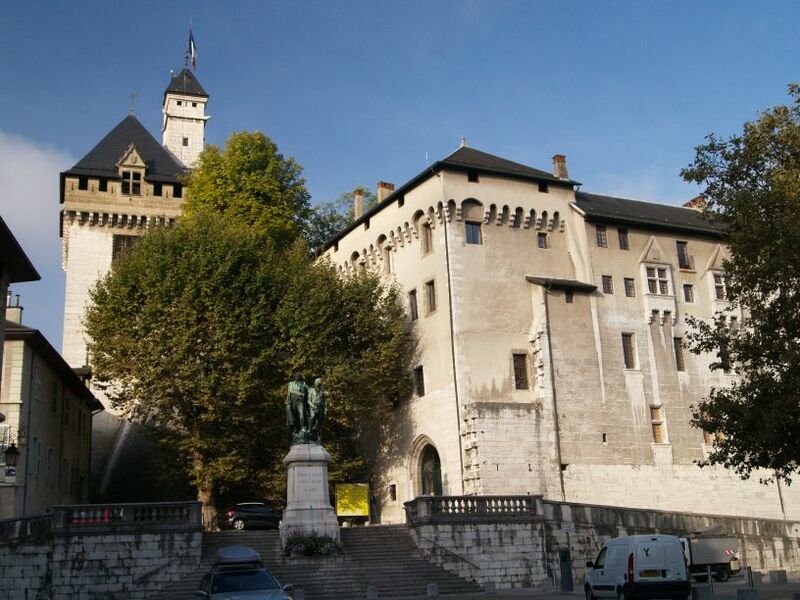 Chambery, France: The old castle at Chambery, Chateau des Ducs de Savole, viewed from the Place du Chateau. 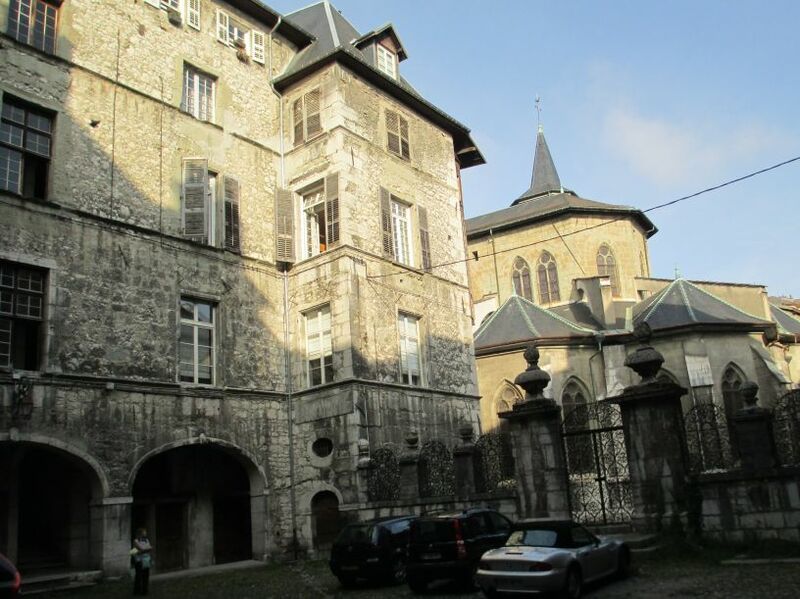 It was the former residence of the Counts and Dukes of Savoy and was built and developed from the 13th century onwards. 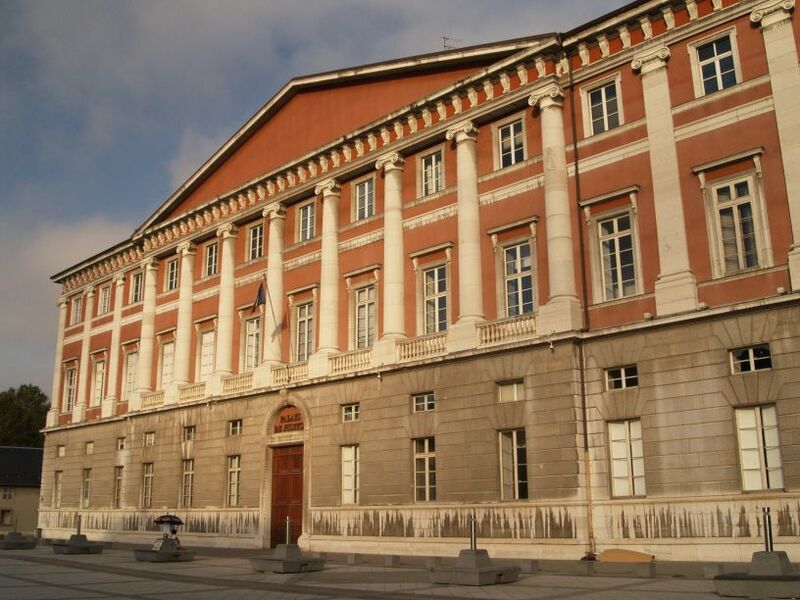 It is now used as the police headquarters and Savoy's General Council. 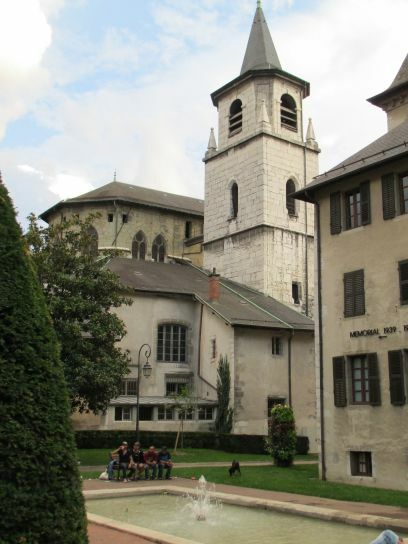 Chambery, France: On the right is the chapel of the Chateau. 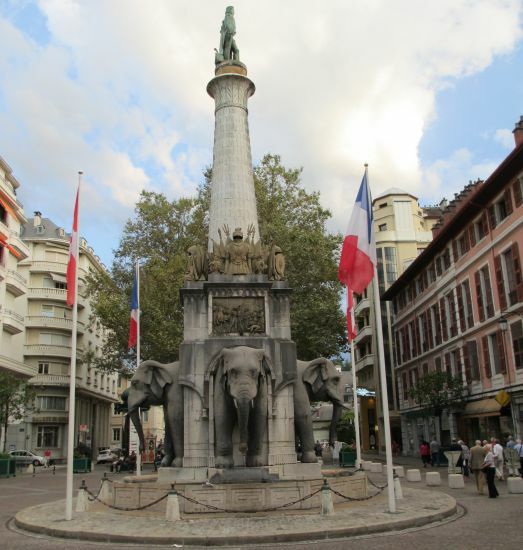 Chambery, France: Place Saint - Leger. 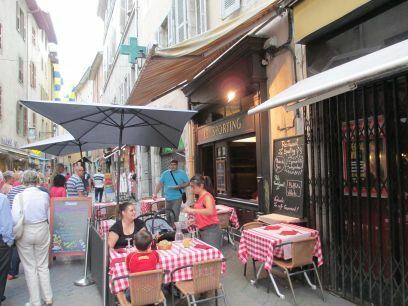 The street and area around Place Saint-Leger are lined with tall houses all painted in different colours and lots of outdoor restaurants and cafes allowing you to enjoy the 'old town' atmosphere. 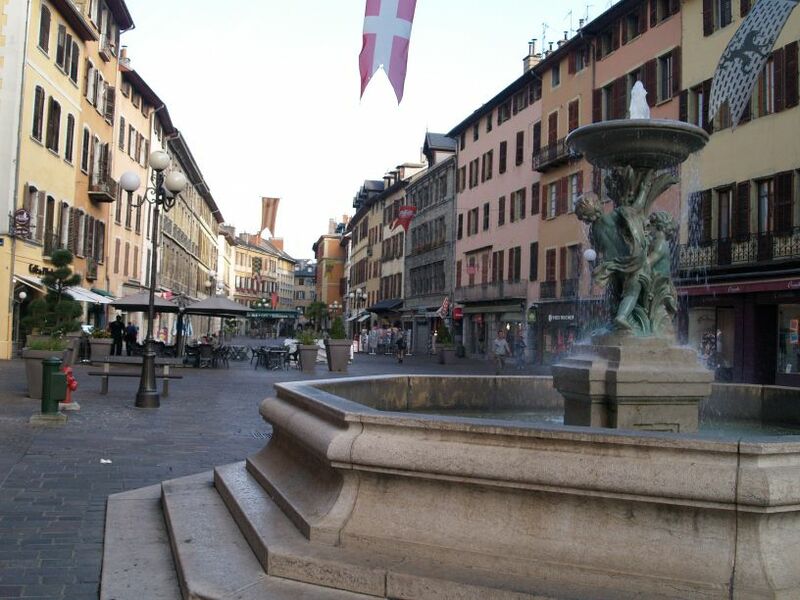 Chambery, France: The fountain in Place Saint-Leger. 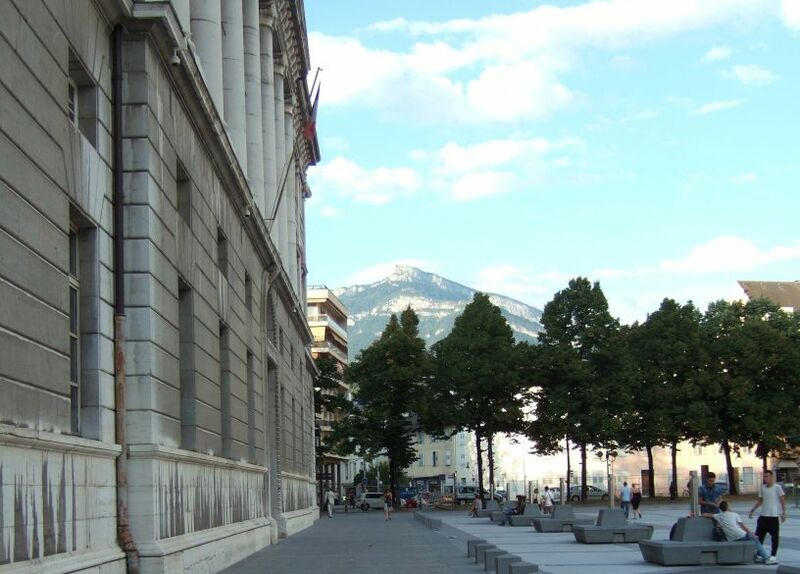 Chambery, France: View of the Alps from the market square in front of the Palais de Justice. 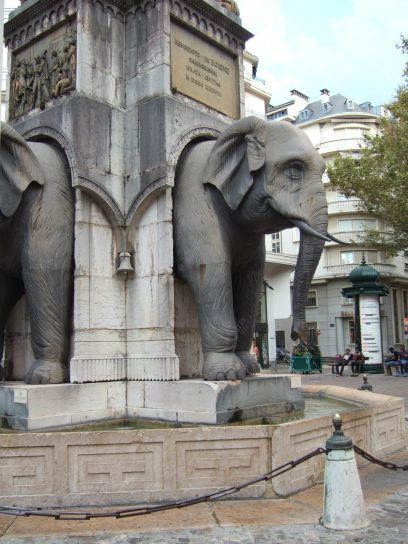 Chambery, France: The Fontaine des Elephants, the glorious and magnificent elephant monument erected in 1838 in tribute to General de Boigne, a major benefactor to his hometown of Chambery. 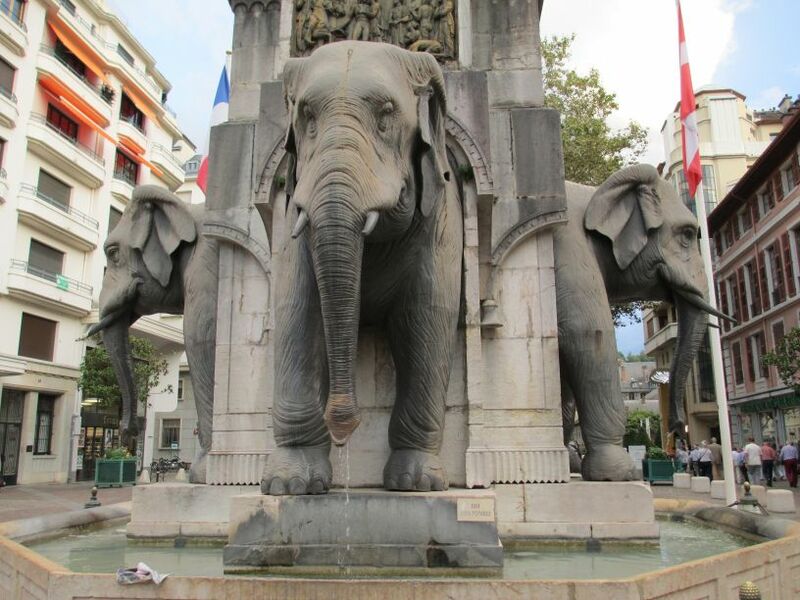 Chambery, France: Fontaine des Elephants, with the General on the top! 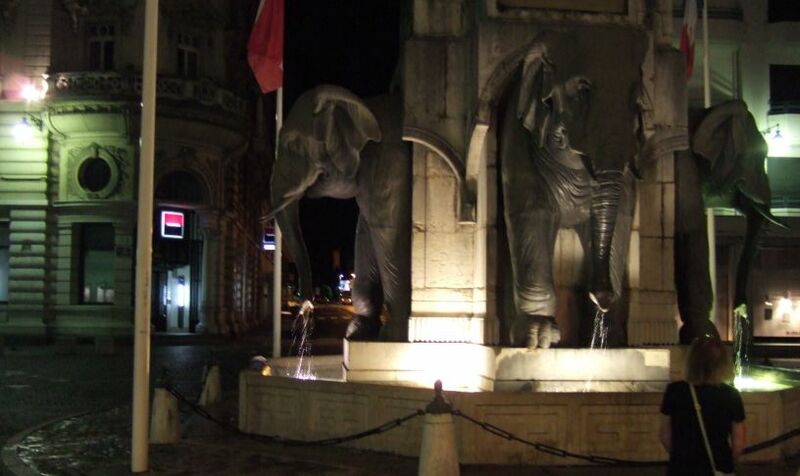 Chambery, France: Fontaine des Elephants by night. 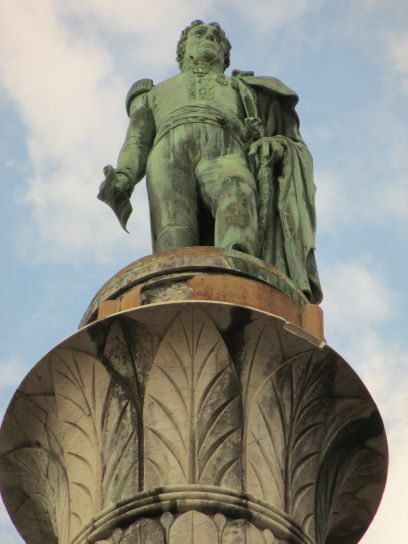 Chambery, France: Statue De La Sasson, Statue de la Savone: Sculptor Alexandre Falguière , the statue was erected on the town square in 1892 to celebrate the centenary of the annexation of Savoy to France. The term " Sasson " is the facetious name given quickly Savoyard language by inhabitants of Chambéry after installation due to its considered too corpulent . Translated as " fat woman ", 2 means it ironically a girl or a woman a little simpleton , visibly more developed body and mind . 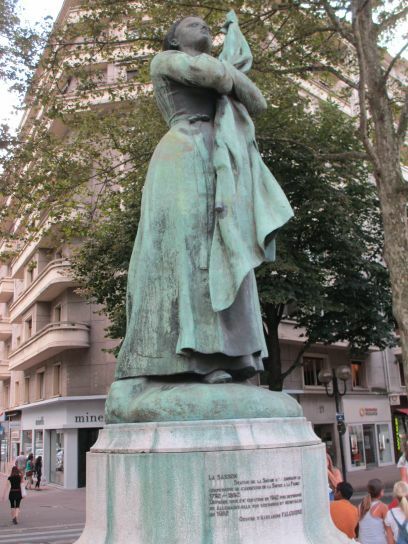 The statue is supposed to represent a Savoyard , in the guise of a woman with severe forms allegory, wearing a dress with big buckets and floor shoe giant , hugging a flag. The work is an investment casting hollow bronze , placed on a concrete base and the work of sculptor Jean Alexandre Joseph Falguire. 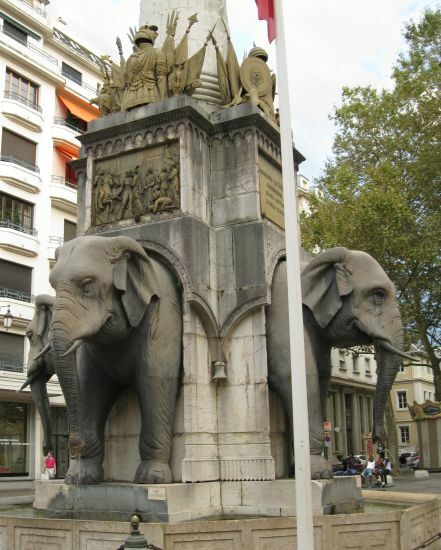 The monument was inaugurated in 1892 by President Sadi Carnot during ceremonies commemorating the centennial of the annexation of Savoy to France at the time of the French Revolution ( November 1792). In 1898 , a model of the Sasson is presented at an exhibition in New Falguire circus in Paris. The statue was toppled and confiscated by the Germans during the Second World War she was found decapitated in a train station in Germany. 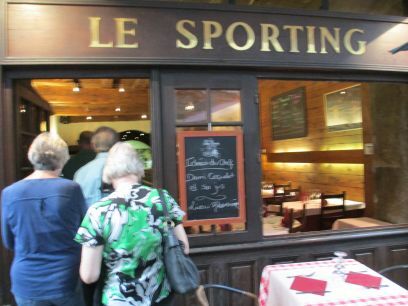 In 1950, she found her place in the city of Chambery. The Sasson regularly acts as a rallying point for many popular and student demonstrations . 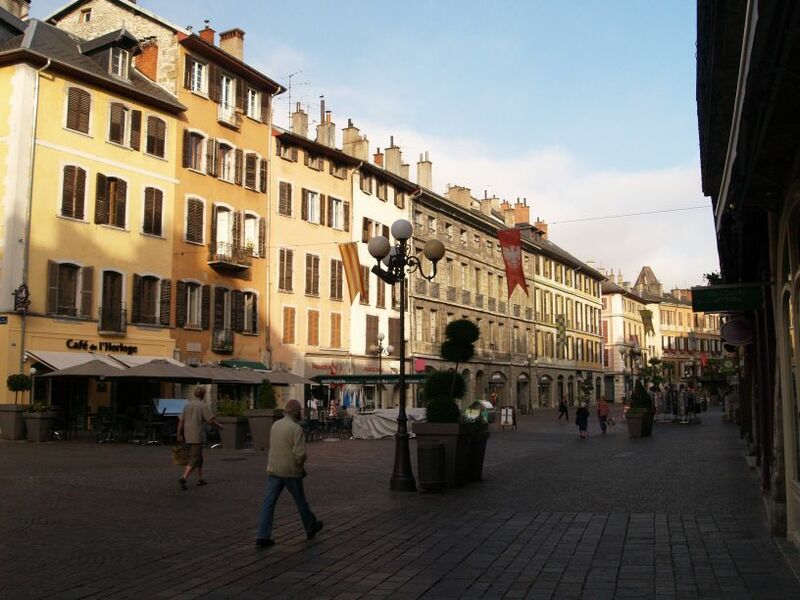 Chambery, France: Place de la Metropole, the Cathedral entrance on the right. 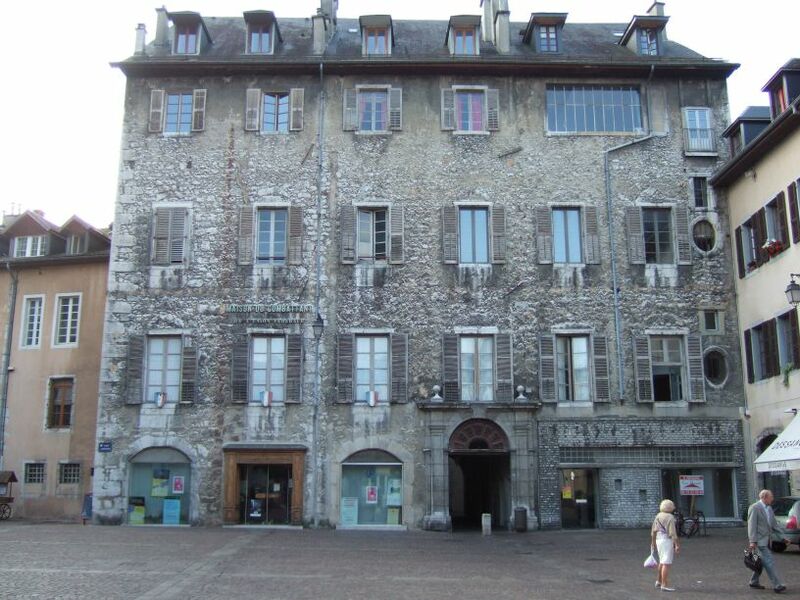 Chambery, France: A large multi-storey house in Place de la Metropole. 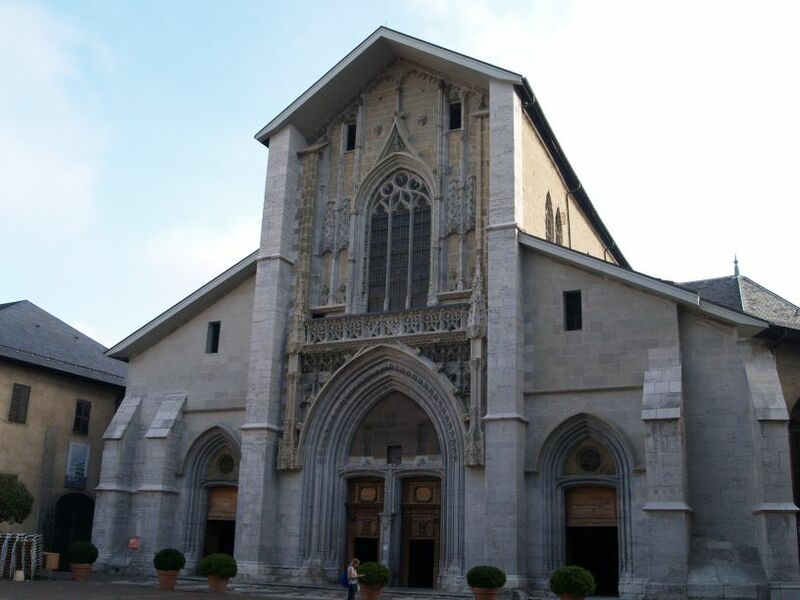 Chambery, France: The west facade of Chambery Cathedral, Cathedral Saint Francis de Sales (Cathédrale Saint-François-de-Sales de Chambéry). 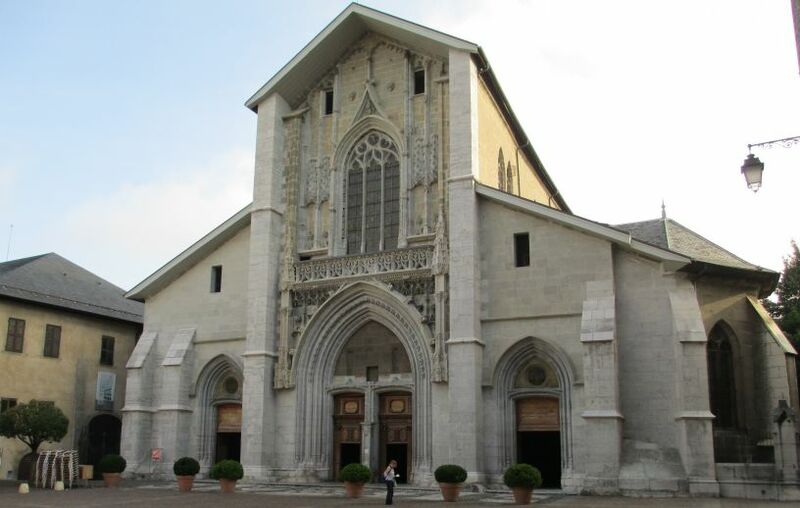 Chambery Cathedral was erected in the 15th century by Franciscan monks and it became a cathedral in 1779 during the creation of the diocese of Chambery. Chambery, France: The west entrance to the Cathedral of Saint Francis. 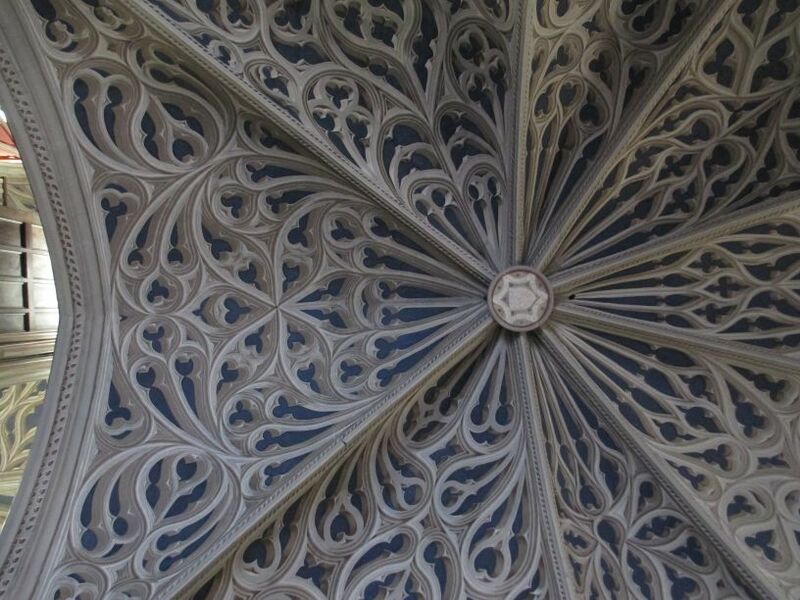 The building dates from the 15th century, when it was constructed as a Franciscan chapel. The site is very swampy and the building is built on 30,000 poles of pinewood. 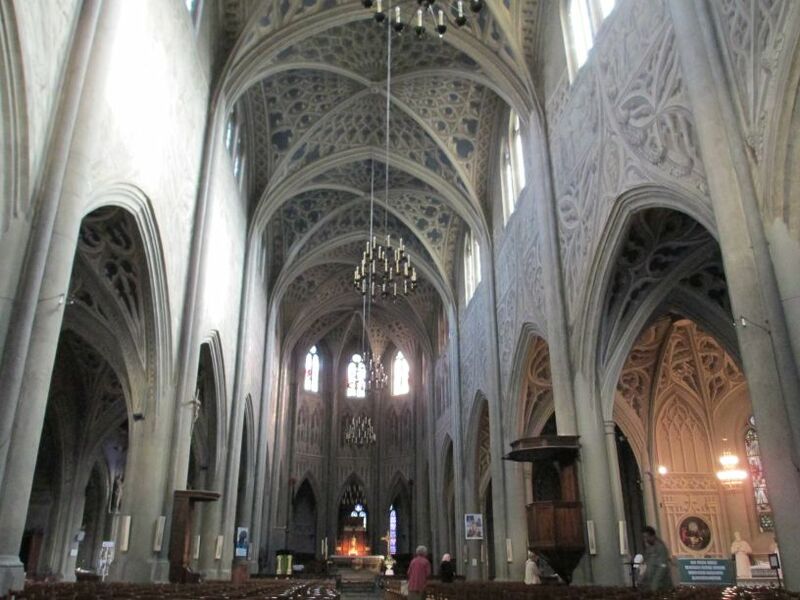 Chambery, France: Looking down the nave towards the chancel and altar of the Cathedral of Saint Francis. It contains the largest ensemble of trompe l'œil painting in Europe (almost 6,000 m²) by the artists Sevesi and Vicario. 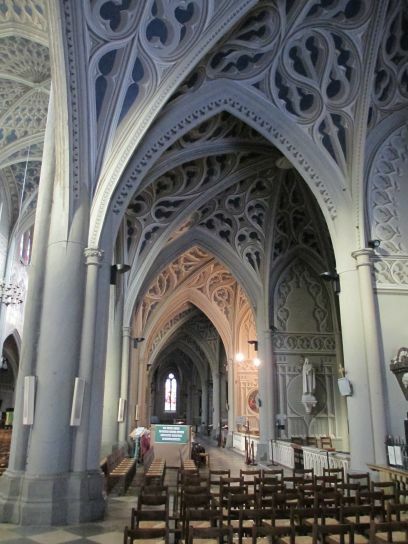 Chambery, France: The elaborate decoration of the nave and aisles of the Cathedral of Saint Francis. 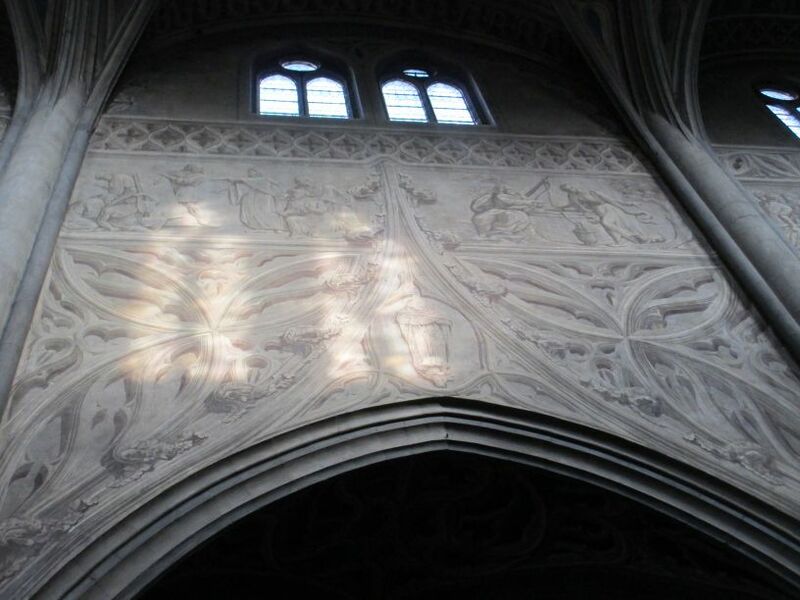 Chambery, France: The skilful painting of the walls to give the impression of sculpture in relief in the Cathedral of Saint Francis. 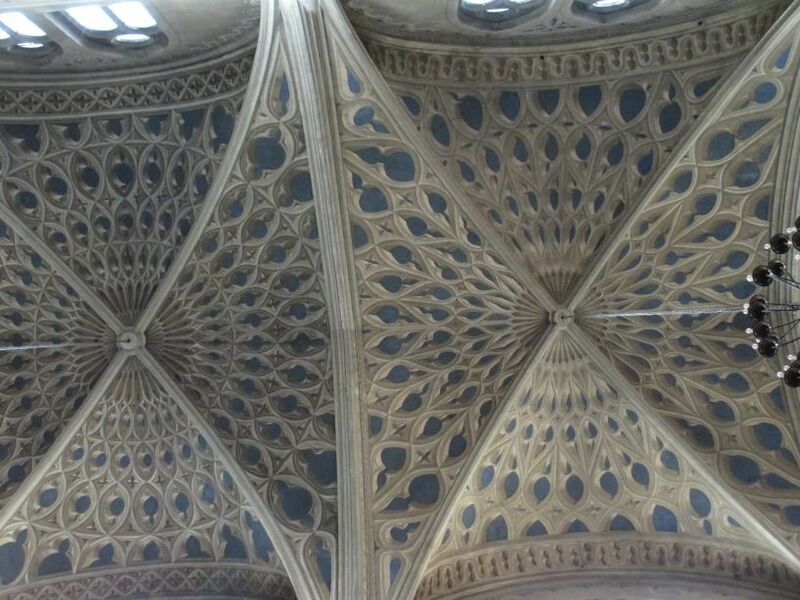 Chambery, France: Nave roof and vaulting of the Cathedral of Saint Francis. 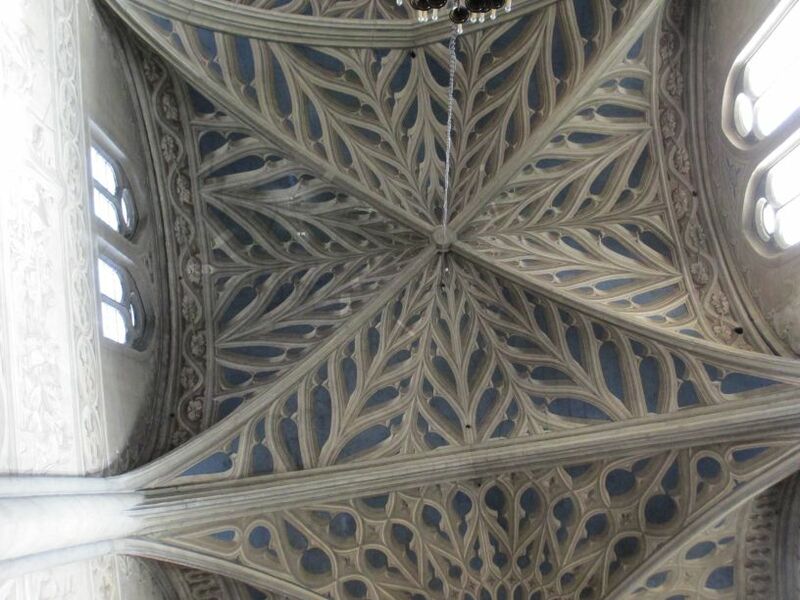 The trompe l'œil paintings is an art technique that uses realistic imagery to create the optical illusion that depicted objects exist in three dimensions and the walls and roof of nave and aisles of Chambery Cathedral are one of the best examples of it in Europe. 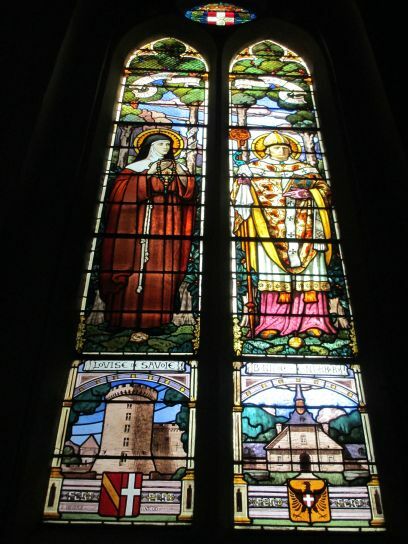 Chambery, France: of the Cathedral of Saint Francis. 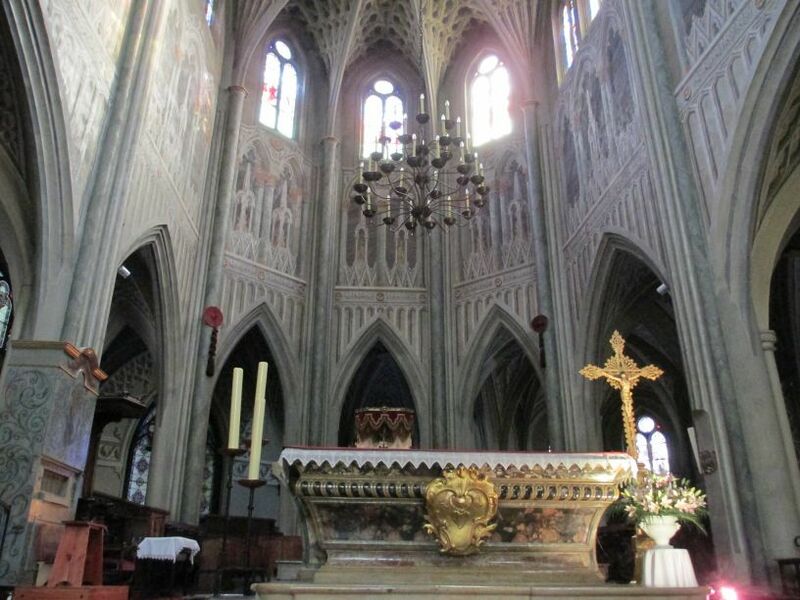 Chambery, France: The chancel and high altar of the Cathedral of Saint Francis. 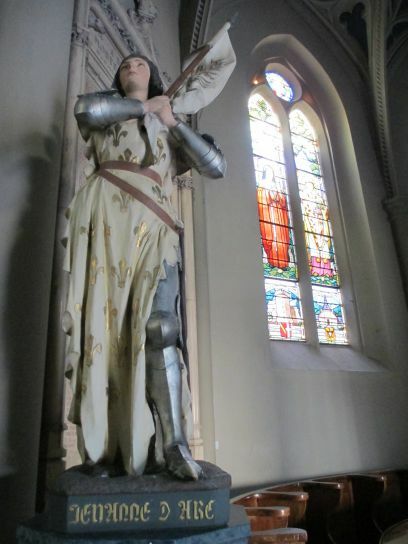 Chambery, France: Left: The statue of Jeanne of Arc (the French heroine Joan of Arc) in the blessed of the Savoy's house chapel. 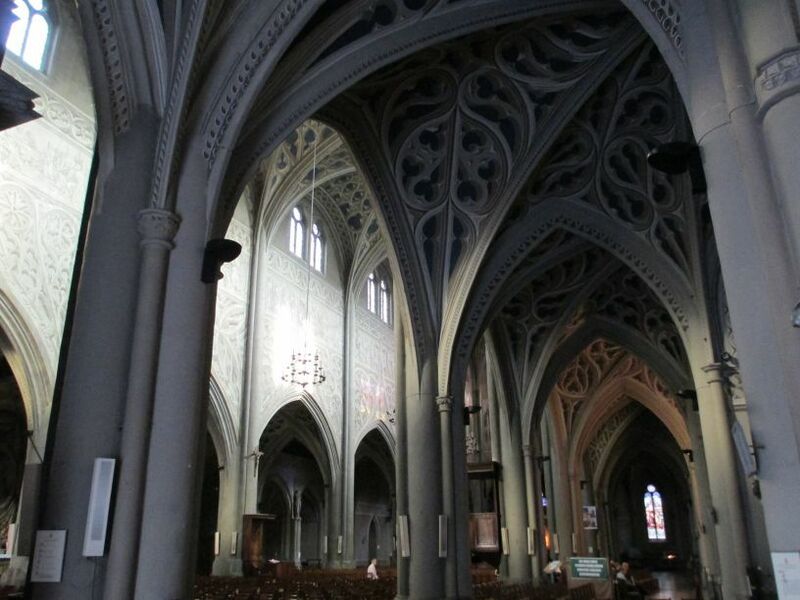 Right: A view down the south aisle of the Cathedral of Saint Francis. 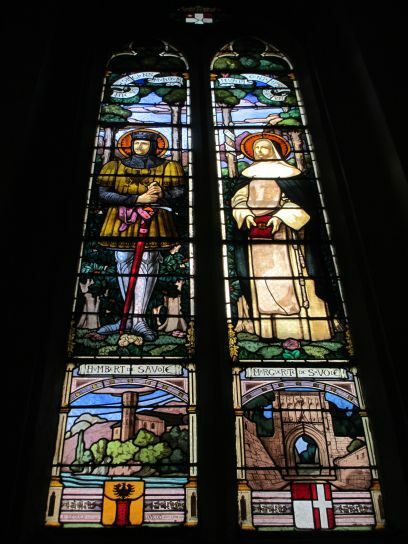 Chambery, France: The stained glass windows in the Savoy's house chapel of the Cathedral of Saint Francis. 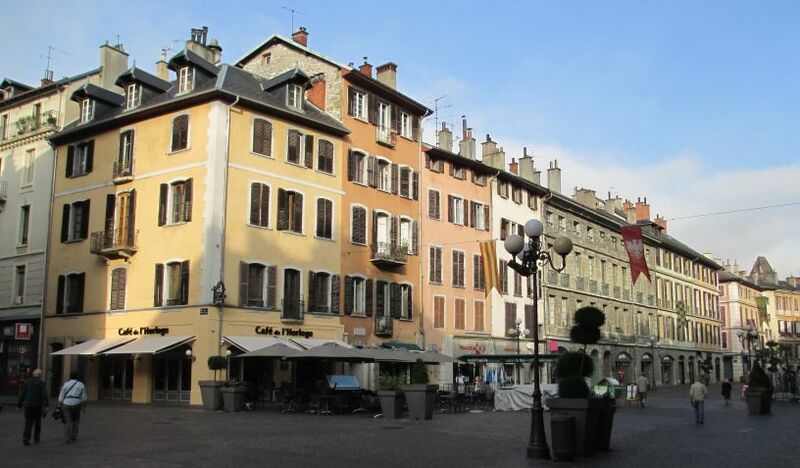 Chambery, France: The old buildings to the south of the Cathedral, the east end can be seen on the right. 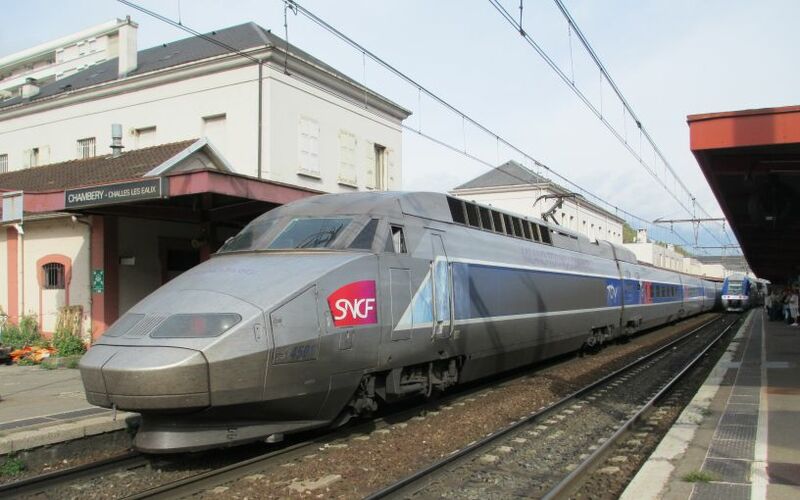 French SNCF trains and locomotives etc. Italian TRENITALIA trains and locomotives etc. French images pictures photos docspics France © Phil Brown * cheap flights to Chambery train fares Eurostar luxury hotels Chambery restaurants bars cafes cheap holidays in France cheap Chambery hotel rooms cheap flights to Chambery art galleries in Chambery historic churches in Chambery museums in Chambery where to stay in Chambery tourist information for Chambery best things to do in Chambery top tourist attractions in Chambery skiing holidays guided mountain walks Treyn Railway Holidays to France, Italy and Spain from to Chambery France Booking tickets for Great Railway Journey luxury Rail Trip holidays Train travel in Europe Rail holidays from to Chambery France to the USA & Canada luxury train through the Rocky Mountain Canadian rail railway holidays through the Rockies US Cities by train from to Chambery France Continental rail holidays to France Germany Italy Austria Switzerland Glacier Express Treyn Holidays from to Chambery France from Eurostar to Paris Brussels Avignon Turin Turino Rome Roma Florence Firenze TGV fast trains Railway travel holidays special steam excursions from to Chambery France great steam heritage line and offers luxury Pullman coach dining trains to Chambery France Travelling by train always seems a pleasure, especially if through wonderful scenery to Chambery France in England, Scotland, Wales or on holiday in the rest of Europe! The railway trip from to Chambery France involves seeing or travelling behind a 'real' steam locomotive in action and there is nothing like the sight and sounds of a steam train to invoke feelings of nostalgia in some of us to Chambery France even more luxury by having a special trip out on a steam dining train! England Scotland Wales Northern Ireland top class hotels in to Chambery France dining out travel tours top tourist destinations tourist information on to Chambery France weekend breaks mini-breaks family holidays restaurants touring coach trips from to Chambery France continental tours cruise ships pleasure cruises summer breaks spring breaks continental winter breaks European winter holidays spring holidays summer holidays European Rail tours Railway travel holidays special steam excursions from to Chambery France A great steam heritage line and offers luxury Pullman coach dining trains European Rail tours US and Canadian Railway travel holidays special steam excursions to Chambery France A great steam heritage line and offers luxury Pullman coach dining trains Travelling by train from to Chambery France always seems a pleasure, especially if through wonderful scenery either in England, Scotland, Wales or on holiday in the rest of the railways of Europe! The railway trip involves seeing or travelling behind a 'real' steam locomotive or heritage diesel in action on a special trip from to Chambery France Booking Eurostar Continental Rail Travel Tour Tickets Stuttgart Brussels Eurostar Brussels from to Chambery France by TGV to Ebbsfleet International, Ashford International Stratford International, St Pancras International Paris Gare du Nord Paris Gare de Lyon Paris Gare de L'est Paris Gare Montparnasse by Eurostar from to Chambery France London to Paris, Eurostar London - Brussels Eurostar London to Lille deals bargain city breaks Great Railway Journey holidays in Italy, Spain and France by TGV booking from to Chambery France business holiday flights from Heathrow Terminals business holiday flights from Gatwick Airport business holiday flights from Stansted Airport business holiday flights from Manchester Airport business holiday flights from East Midlands Airport business holiday flights from Leeds Bradford Airport business holiday flights from Birmingham International Airport business holiday flights from Luton Airport to/from Chambery France by VLM Airlines - the business airline that focuses on flying to regional airports, located close to city centres. Flights to London City Airport, with daily operations to Amsterdam, Antwerp, Brussels, Luxembourg. 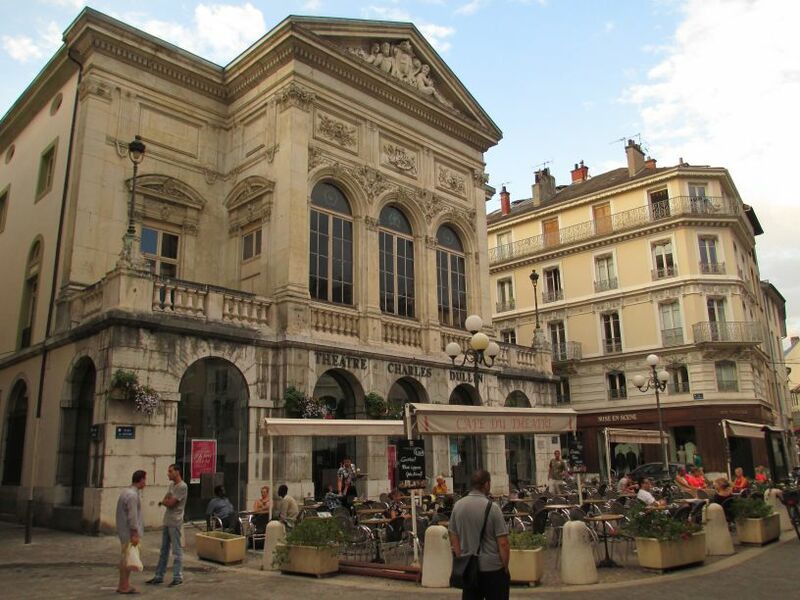 to/from Chambery France by British Airways - can meet all your travel needs including air fares flights business class schedules and prices for the holiday maker and executive traveller. Website has easy on-line booking system that offers competitive prices. to/from Chambery France Jet2.com - low cost airline - find low cost flights to major European destinations including cheap flights to Amsterdam, Alicante, Paris, Palma & Prague. Click to book cheap flights online plus find online flight timetables, destination guides, last minute flights & special offers on cheap flights to Europe with Jet2.com. to/from Chambery France by EasyJet The low cost airline, HQ @ London Luton flying to destinations around Europe and the UK. The first low-cost airline Easyjet flies 150+ routes between 4+ key European airports for business and leisure travellers. Book Easyjet tickets online and get a webfare discount saving you money. 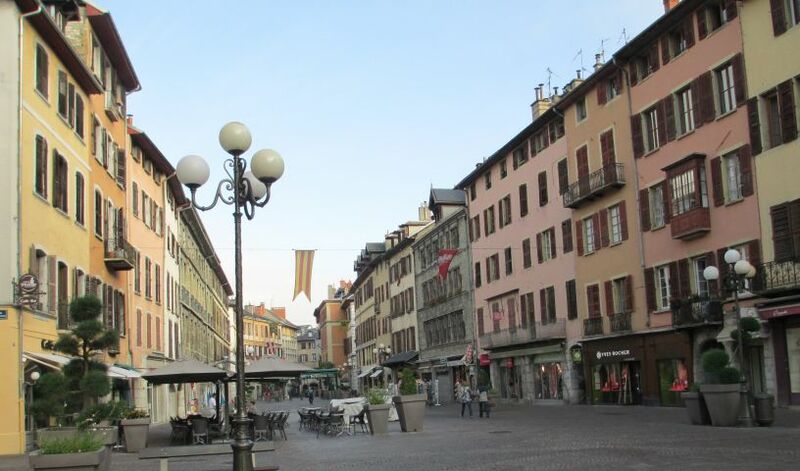 to/from Chambery France by Ryan Air the Low Fares Website. Serving all major airports in England, Ireland and Europe for the low cost flights. Special travel offers and flight discounts available weekly for online shoppers. RyanAir Flights, Ticket News and Online Travel Information. to/from Chambery France by Monarch Airlines offer cheap flights to a wide range of popular European holiday destinations such as London, Majorca and Barcelona. Book budget flights online quickly and easily with their online booking system. Book independent travel scheduled flights and check out the full range of services Monarch have to offer. They run both scheduled and chartered passenger flights to and from the UK. to/from Chambery France by Virgin Atlantic Airways Booking is made easier online with Virgin Atlantic's website also includes frequent flyer information and special offers for travellers. Very impressive website to/from Chambery France by Astraeus operates a range of charter services to destinations throughout Europe, the Middle East and North Africa. On charter flights, all seats on the aircraft are sold by Astraeus to a holiday or flight-only company that is then responsible for individual reservations; public can not book direct. 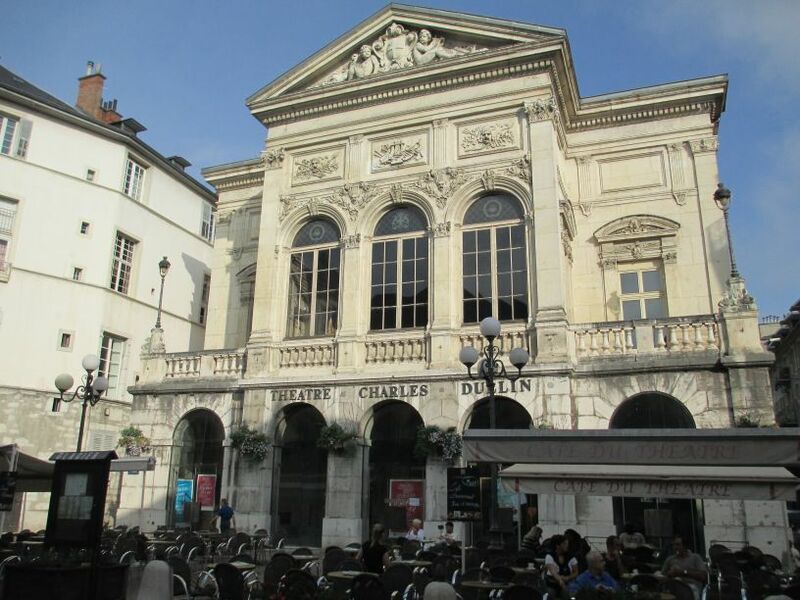 to/from Chambery France by Aer Lingus Starting with one aircraft in 1936, Aer Lingus has grown into one of the world's most-admired transportation companies. From Ireland, UK, USA and Europe to all over the world. The Gold Circle Club rewards Aer Lingus frequent flyers with a wide range of benefits and privileges. to/from Chambery France by bmi British Midland bmi is the UK’s second largest full service airline and has its main operational base at London Heathrow where it holds 14% of all take off and landing slots. The airline operates over 2,000 flights a week with a fleet of 53 jet aircraft which have an average age of five years. bmi serves 25 destinations in 10 countries. to/from Chambery France by Brussels Airlines SN Brussels Airlines and Virgin Express are now one company: Brussels Airlines. Offering the best of two companies, Brussels Airlines flies to more than 70 destinations worldwide, offering you the choice between flexible tickets and the lowest fare. Discover all the destinations and fares available online. to/from Chambery France by Aurigny the Premier Channel Island airline. Flights to Destinations include London, Bristol, Manchester, Guernsey and Jersey. You can book flights online, see the inflight magazine and book short city breaks. to/from Chambery France by Eastern Airways domestic flights covering the UK, 17 regional airports from Stronoway to Southampton. Operate to and from the majority of airports across both the UK and Europe. to/from Chambery France by Emerald Airways FlyJem.com is an aviation group employing upwards of 250 people in various roles. The company operates over 30 freight and passenger aircraft on scheduled and ad-hoc services throughout the UK and Europe. 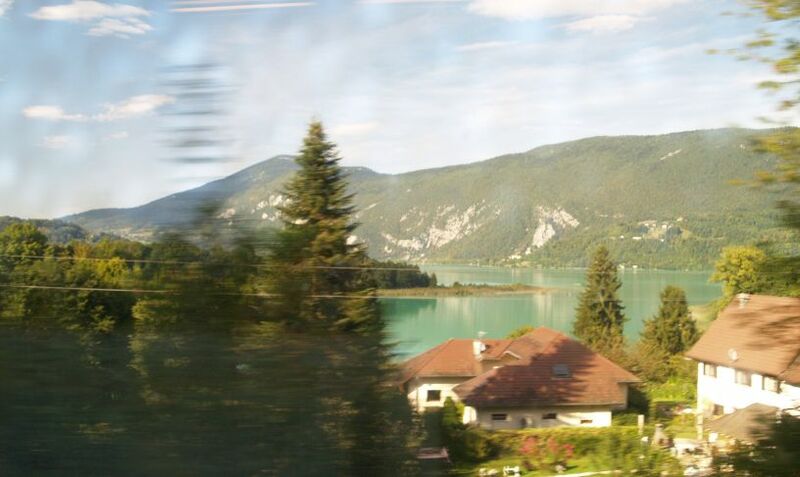 to/from Chambery France by Air New Zealand Air New Zealand airfares, flights, air points (frequent flyer miles), Express and Gotta Go air fares. Book air travel reservations, holidays, travel packages online. Air New Zealand are great airline, we have used them much here @ UK Superweb over the years, the only way to fly when going global. to/from Chambery France by Qantas was founded in the Queensland outback in 1920. Registered originally as the Queensland and Northern Territory Aerial Services Limited (QANTAS), Today, Qantas is widely regarded as the world's leading long distance airline and one of the strongest brands in Australia. to/from Chambery France by Air Europa Líneas Aéreas, S.A. is the first private airline of Spain. Currently AIR EUROPA flights from Spain to more than 140 destinations around the world to/from Chambery France by Air Iceland With AirIceland you can book a flight online (online bookings secure) and view timetables. You can get information on all destinations and find out about various activities for your vacation and holidays in Iceland. You can also join a netclub for cheaper flights and special prizes. to/from Chambery France by Swiss International Air Lines offers 72 destinations world wide, one of the youngest fleets and excellent service. Find here airline tickets, business class airfares, first class airfares, last minute flights, easy online flight booking and company news. to/from Chambery France by British NorthWest Airlines is the airline serving the busy Blackpool - Isle of Man and Belfast routes in the North West. Frequent, reliable services allow the business traveller, commuter, and tourist to take advantage of low BNWA prices and professional, caring services. 21. Air Atlanta Icelandic is the largest ACMI service provider in the world offering tailor-made solutions to other carriers, both in the passenger and cargo industry. Website details, services, fleet information and the routes they fly. to/from Chambery France by Air Baltic a Latvian airline flying out of Dublin and London airports, Baltic Airlines is a low cost, no frills airlines selling cheap flights to Riga, Vilnius, Tallinn, Minsk, Moscow, St Petersburg, Kaliningrad, Kiev, Odessa, Simferopol, Dnepropetrovsk, Baku, Tbilisi and Tel Aviv. You can check availability and buy cheap air tickets online.